Pharaoh Userkaf, 1st king of the 5th dynasty, ruled Egypt for ~7 years. He built his pyramid at Saqqara at the northeast corner of Djoser's complex. The local description for the the pyramid is el-haram el-makherbish "ruined pyramid". The pyramid is not on the tourist track and requires a 30 minute track tru the soft sand from the step pyramid to reach. The pyramid has been stripped of its outer casing and appears as a heap of rubble. Part of the black basalt open court floor is still visible. 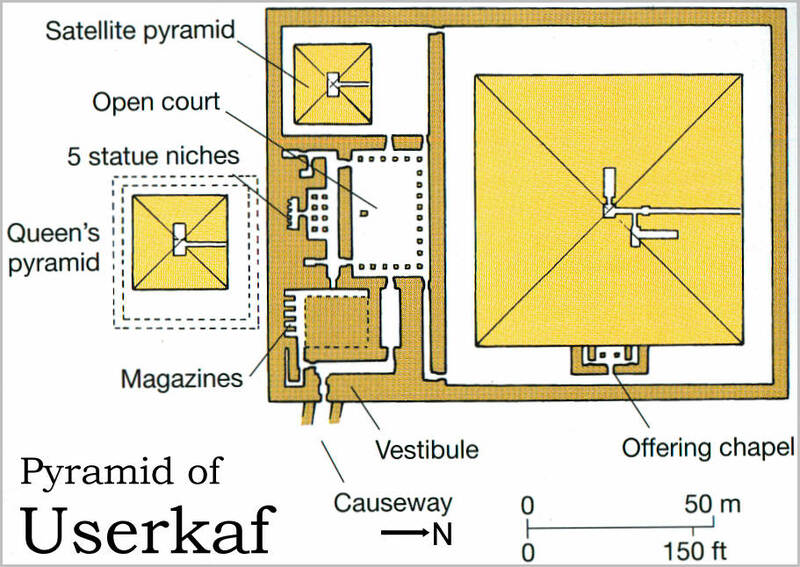 A satellite pyramid, 21m square, and third pyramid just south of and outside the enclosure wall, was apparently for a queen whose name is Neferhetepes. The open courtyard appears to be in a trench several meter lower than the surrounding desert. Egyptologist are still debating the reasons why Userkaf, the founder of the Fifth dynasty, would build his pyramid on this particular location, away from the 5th dynasty necropolis of Abusir or his predecessor Shepseskaf in south Saqqara. Userkaf wanted to be close the Djoser's step pyramid and this location is probably for political and dynastic reasons.